The Inspiration for TBB’s New Color Scheme! So, if anyone has started checking out the site, you’ll notice that I just changed up the color scheme and general feel of the place! While clicking around the internet, I suddenly realized that my previous colors had been really close to the colors on another popular crochet designer’s website. It’s a color scheme I am generally fond of, and I was a bit sad to let it go, but my new inspiration for this site’s look is getting me all fired up again! 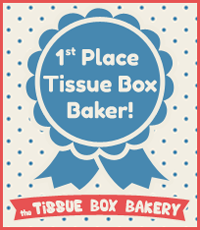 Retro Bakery Time! Here’s the image I fell in love with that gave me my Eureka moment! 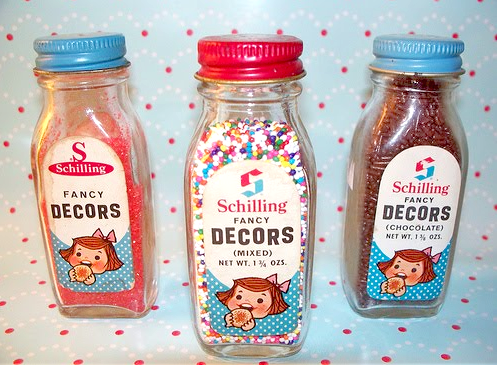 Vintage Schilling sprinkles! But don’t worry. I’m also working on getting up more sample patterns for you guys. I know the clock is ticking for us to get our cozies together by Dec 21 – 22 for Renegade Craft Fair, SF. I spent all night building the PHOTO page to at least give you guys some visual ideas for your projects.